Day 6, Loup Loup Pass to Tonasket: 52.1 miles, 1,656 ft. elevation gain, 13.9mph average speed. Trip Totals: 329.8 miles (54.9 daily average), 20,549 ft. elevation gain, 10.81 mph overall average. I never did get comfortable with our sleeping arrangement last night, so I woke up this morning at 5:00a wanting to get on the road as soon as possible. Dani patiently explained to me that she didn’t think 5:00a was a reasonable start time, so I let her go back to sleep as I took down the bear bag and packed everything I could without taking down the tent with Dani still in it. By this time it was 5:40a, which seemed reasonable enough for me to gently prod Dani awake yet again and express my desire to get on the road. She, as tolerant as ever, allowed me to hassle her out of the tent and onto her bike. Ever since coming down from Washington Pass, the landscape has changed dramatically. 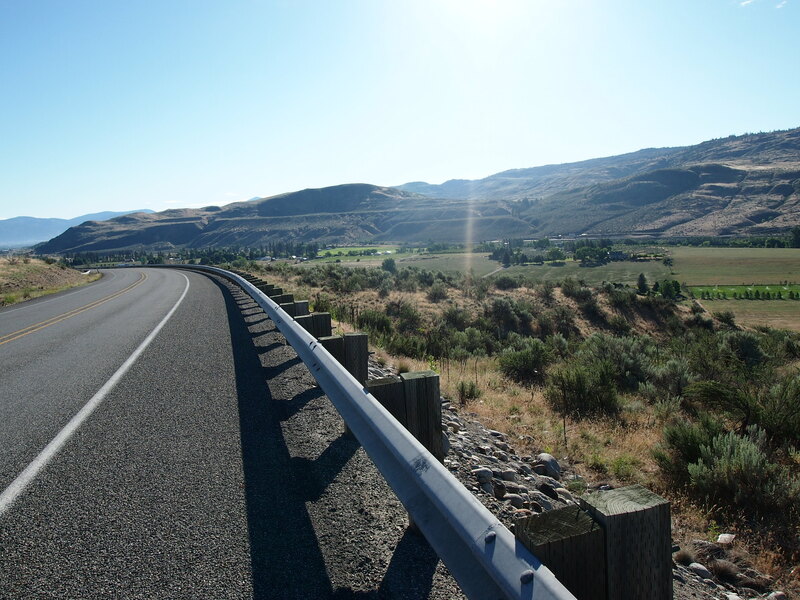 We passed through the dense, lush forests of the west side of the mountains, and we are now moving into the high desert climate of Central and Eastern Washington. We’ve been riding through ranchland and farmland, where bright green patches of irragated fields jump out from the surrounding brown terrain. We also passed by thousands of acres of apple orchards, sometimes with hundreds of acres entirely covered in mesh netting to keep the birds away. And it has become exceptionally hot. The temperature over the last couple of days has been over 90 degrees. I really enjoyed riding through old-growth forests, but seeing the variety the country has to offer is one of the perks of this trip. One thing that I don’t miss about Western Washington is the mosquitoes. I was expecting there to be mosquitoes on this trip, but maybe not until we were passing through Minnesota in mid-July. They have been vicious. This morning, Dani had 11 separate bites in a handspan area on her leg. I’m hoping they become less prevalent as we move into a drier clime. At Okanogan, we stopped to grab a cup of coffee to reinvigorate ourselves and use the coffee house’s wifi to plan our next couple of days. 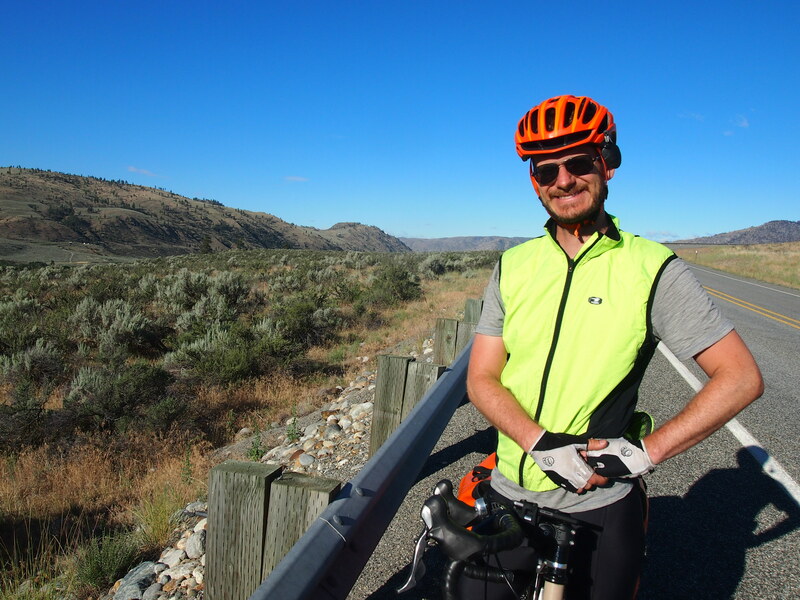 Our ride continued through the towns of Omak and Riverside, before ending in Tonasket. Since we got started so early, we arrived at Tonasket before 2:00p. We’re climbing a couple more passes over the next two days, so we’re happy to have a little shorter, more relaxing day today. 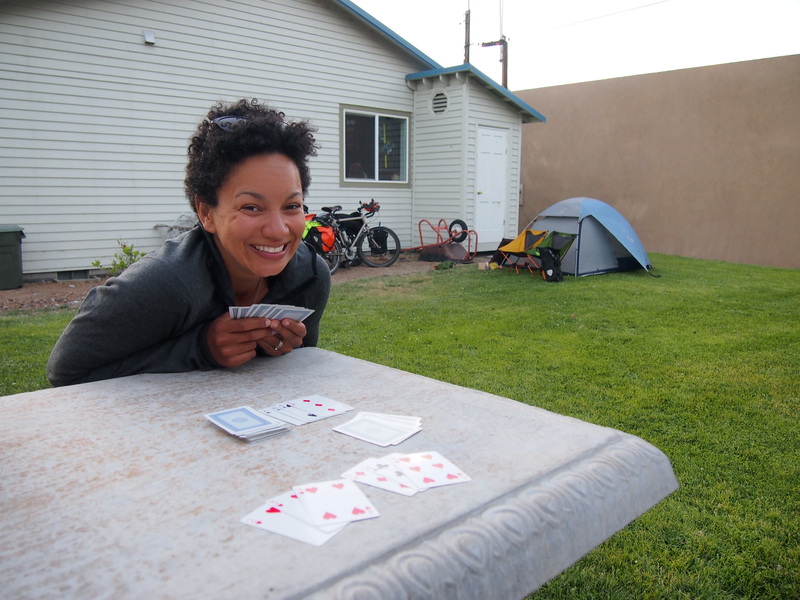 Also, Tonasket offers free camping for cyclists behind their visitor center, which is about as far from last night’s camping experience as one can get, and that’s ok with me! Before settling down for the evening in our private backyard, we tooled around town for a bit, picking up some groceries and grabbing dinner at the delicious local pizza joint, where I proved once and for all how hard-headed I am by standing up and shattering the low hanging light fixture with my head, much to the delight of all of the other patrons. The story has a tragic ending though. There were still three pieces of pizza left, and we had to throw them away because we didn’t want to accidentally eat shattered light fixture for dinner. We climb our penultimate pass in the Cascades tomorrow. We’re both ready for some flatter rides! ← Day 5: Climbing a pass on a rest day. Sorry for being a frequent commenting Uncle, but I am so proud of you. I am a big fan of Western Canada (BC in particular) and you are close – we have great friends in Kelowna BC which I still might hit this summer… Life is beautiful and I am so happy you are enjoying!! No sorries necessary! We’re so happy you’re following along. I wish we had more time because I’d love to head up to BC. It’s definitely on my list of places to visit.